On Thursday, October 15th, Fr. 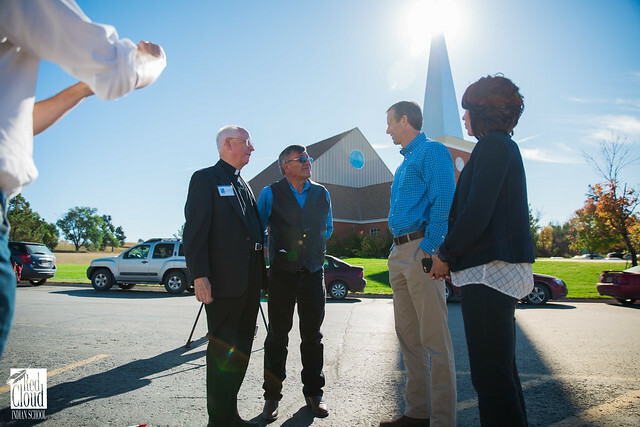 George Winzenburg, S.J., president of Red Cloud Indian School, welcomed South Dakota Senator John Thune and Representative Kristi Noem as they stopped by for a visit on a trip hosted by Oglala Sioux Tribal President John Yellow Bird Steele. During their visit, Sen. Thune and Rep. Noem spent time reading to kindergarten and first grade students. They also participated in Miss Waniya's elementary Lakota language class, where fourth grade students exhibited their knowledge of the language and the state officials learned a bit themselves. Sen. Thune and Rep. Noem made their way to the high school and participated in an open discussion with the high school student council. Students had the opportunity to share their stories and dreams for the future. Fr. George then lead Sen. Thune and Rep. Noem to The Heritage Center for their final stop on campus. Sen. Thune and Rep. Noem, we cannot thank you enough for taking the time to visit our campus and take in what we like to think is a “jewel” of the state. Photos © 2015 Red Cloud Indian School, Inc.